Dr. Donald Abrams provides integrative oncology consultations at the UCSF Osher Center. 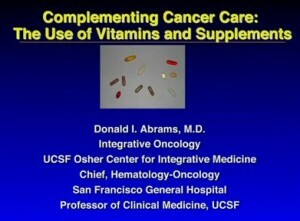 In this presentation he reviews some of the frequently asked questions that he has encountered and gives guidance on the prudent use of vitamins and supplements during and after conventional cancer care. Series: "Integrative Medicine Today"